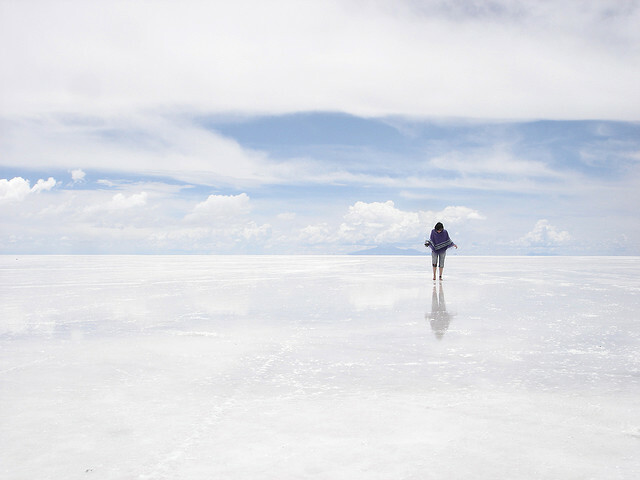 The world’s largest salt flats, Salar de Uyuni in Bolivia, is an other-worldly experience that has to be seen to be believed. 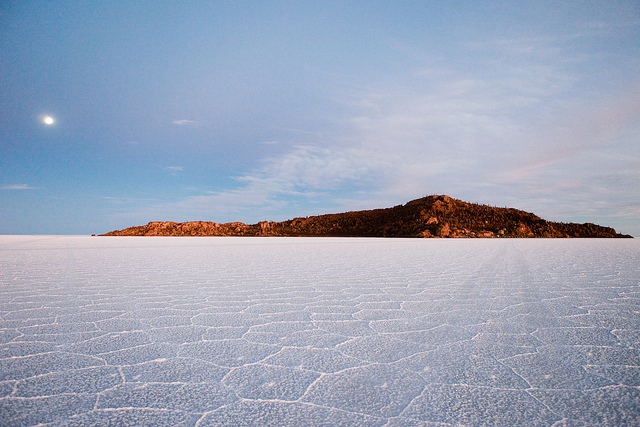 Join us on a trip to one of the strangest places our third rock from the sun has to offer. 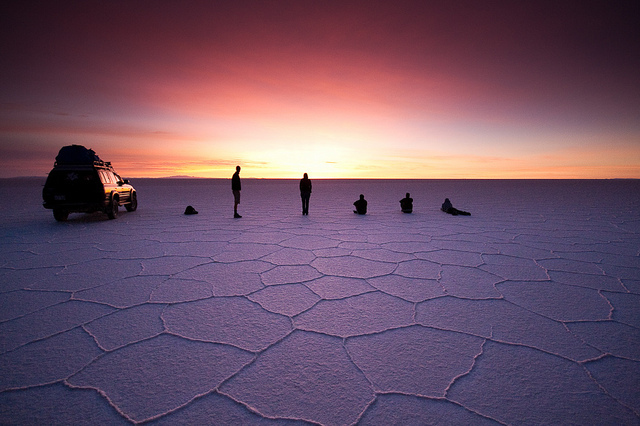 Have you ever wanted to visit another planet but don’t quite have the wallet power (or for that matter the decades it may take for commercial space flight to Mars to become available)? 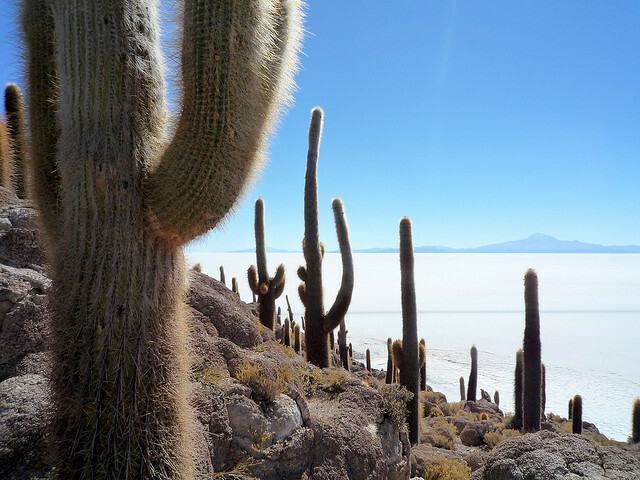 If you want an out of this world experience you could try, as an alternative, Salar de Uyuni in Bolivia. 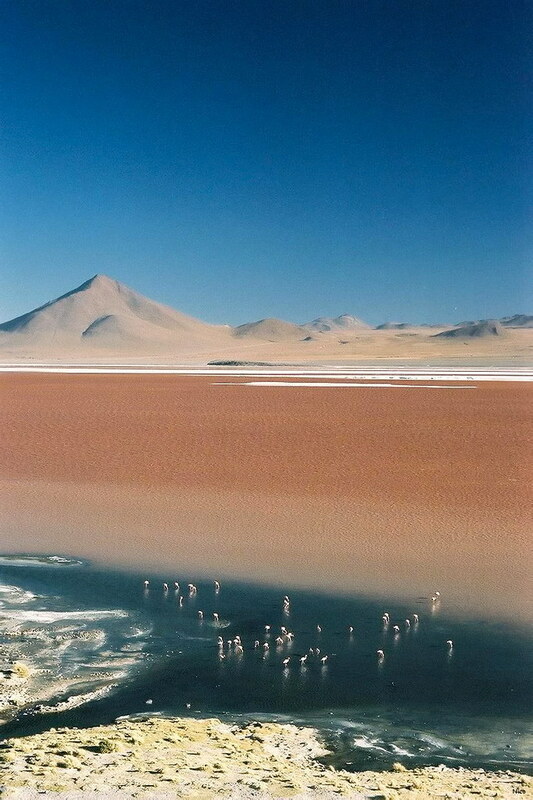 It is one of the few landscapes on planet Earth where you may feel that you are somewhere else in the universe entirely. This place is immense. 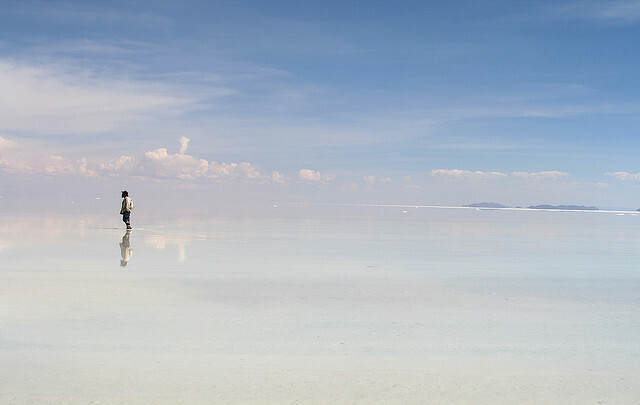 It is over twelve thousand square kilometers in area, which makes it the largest salt flat in the world. 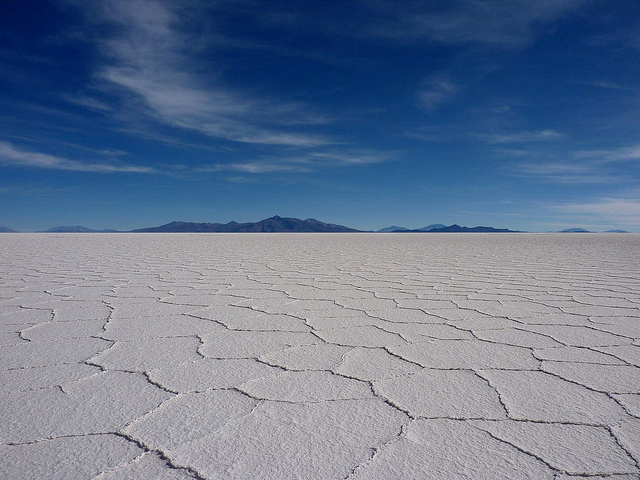 To give you an idea, that is over twenty five times larger than the more famous Bonneville Salt Flats in the United States. 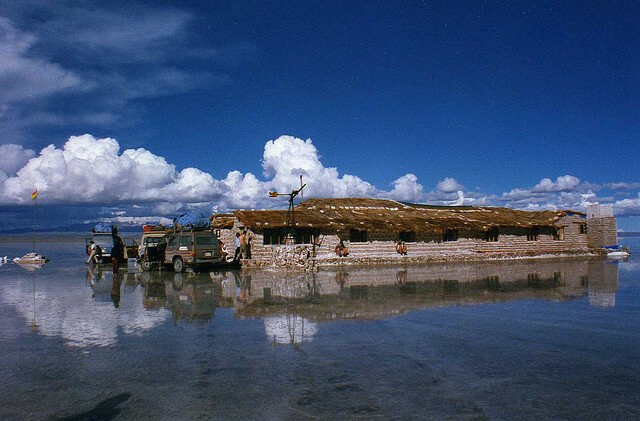 It also has the distinction of being the highest salt flats in the world at three thousand seven hundred meters above sea level. 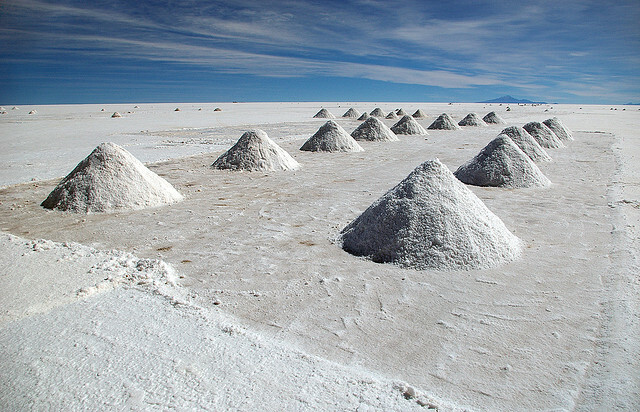 The mounds in these photographs are not, as you may first suspect, a naturally occurring phenomena. The hand of man is at work here. 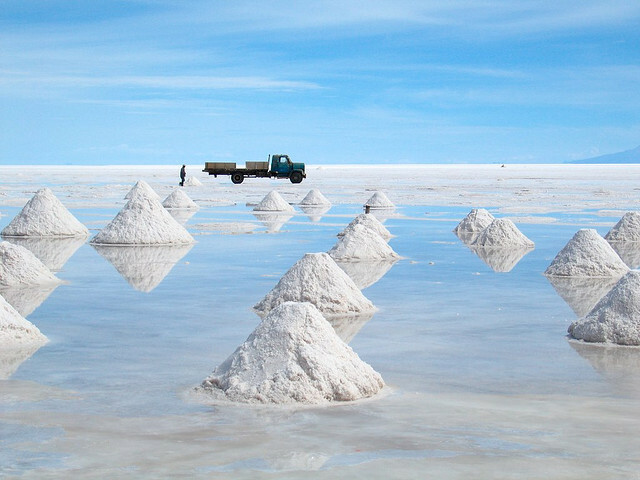 The salt is literally scraped away from the surface and piled up in the mounds that you can see here by the locals. 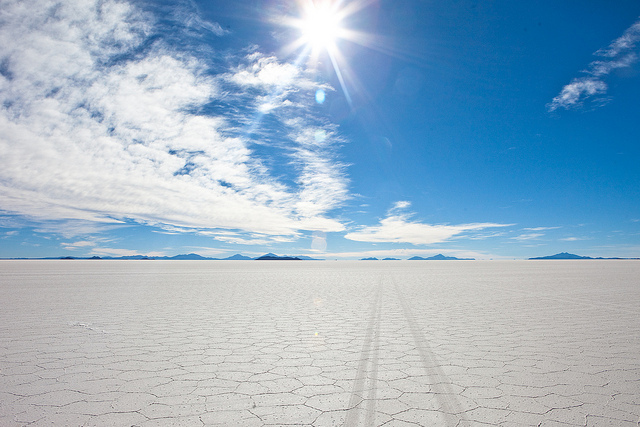 Salar de Uyuni is what remains of a prehistoric lake. 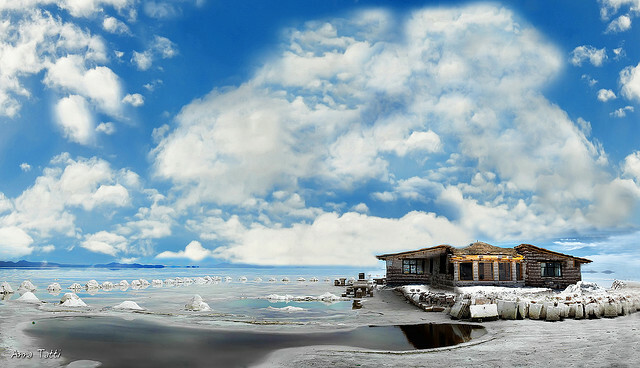 All around it there are mountains which means there are no drainage outlets and the salt is left on the old bed of the lake. After it is scraped up these mounds are then created. 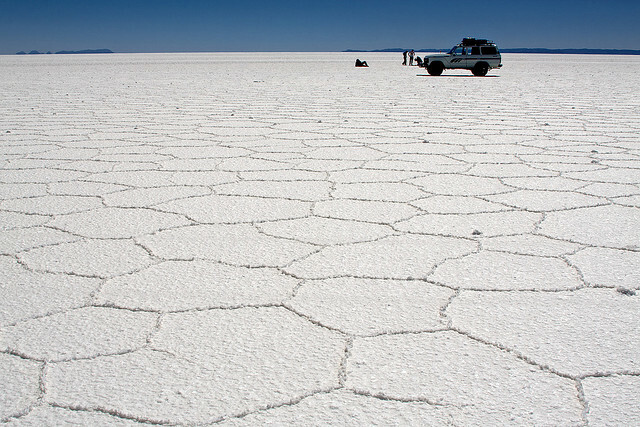 This allows the water to evaporate more quickly and certainly makes the salt easier to transport away from the salt flats. 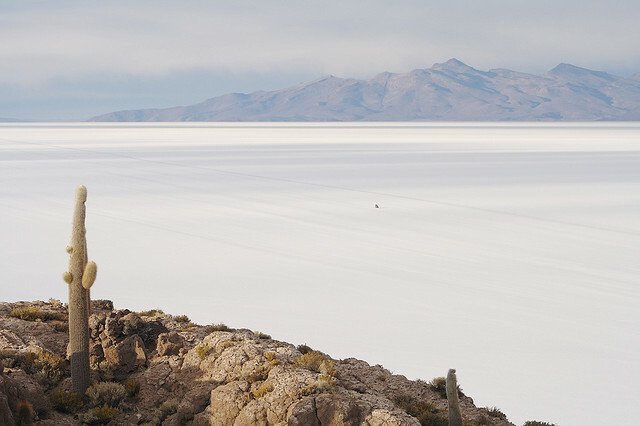 From a distance the salt flats look like a huge white sea. 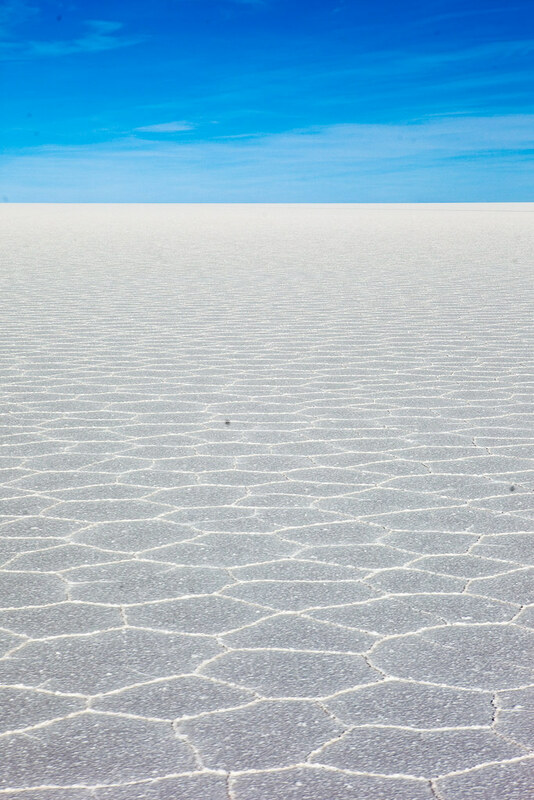 The tiles on the flats stretch on as if to infinity – and beyond. This in itself if simply awesome to behold – and there is no hyperbole there at all. It looks like something out of a science-fiction film – one half expects to see, at any minute, Captain Kirk appear being chased by a couple of Klingons. 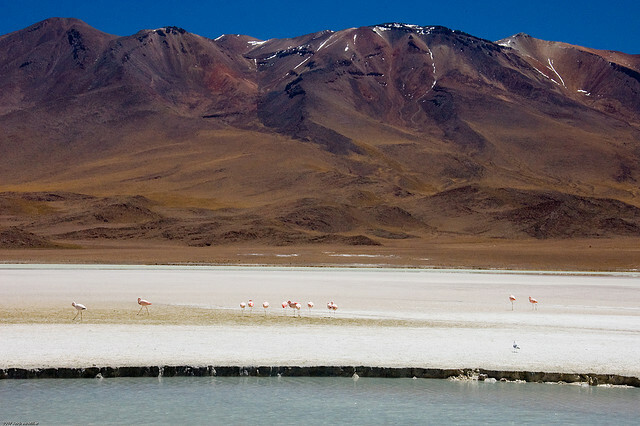 When there is rain – as there is occasionally even at this altitude – then something magical happens. 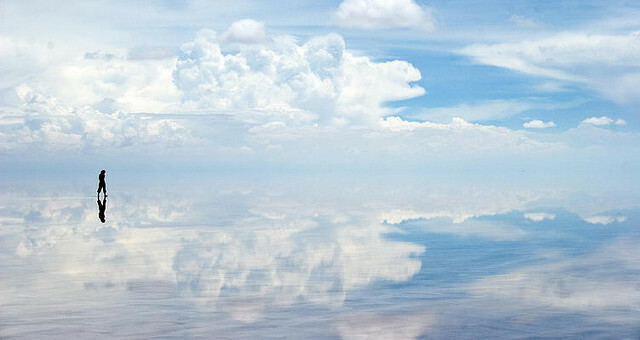 The salt flats become a mirror of the sky. 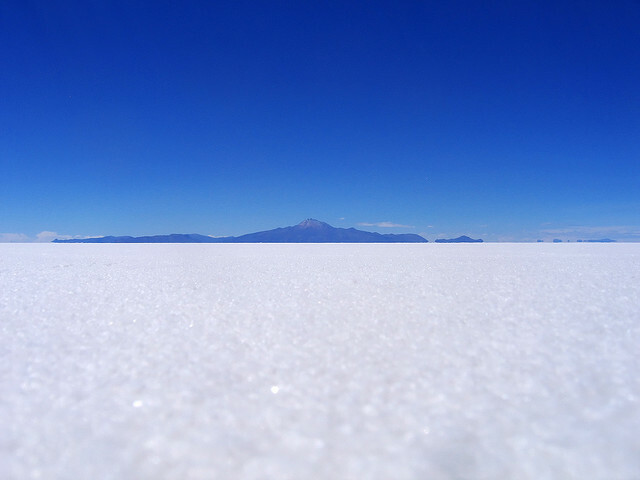 The origins of the Uyuni goes back some forty thousand years. 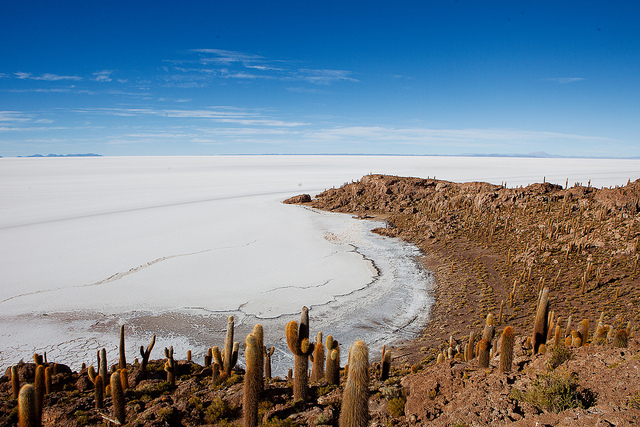 Then it made up part of the huge prehistoric Lake Minchin. 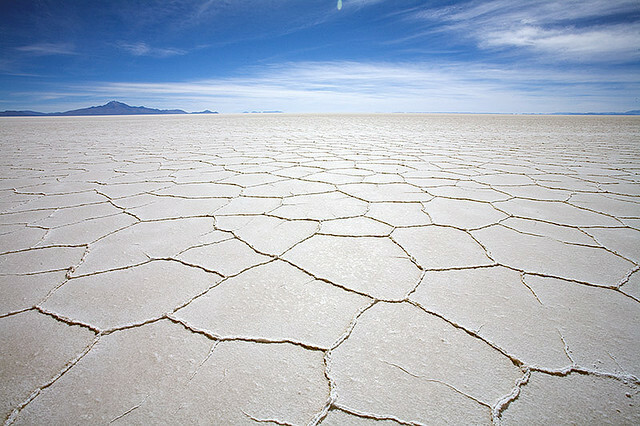 With time the lake dried up. 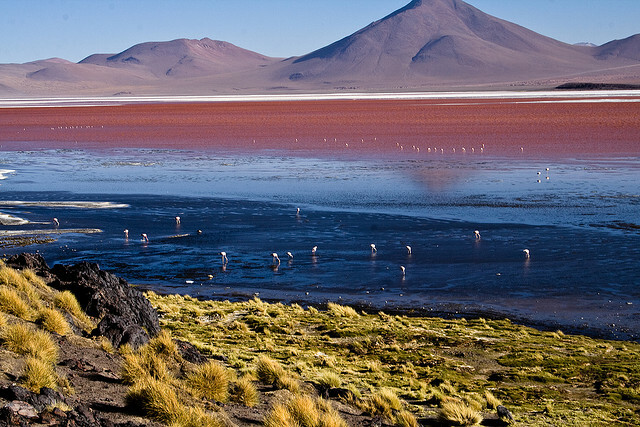 Two lakes still remain – the Uru Uru and (no sniggering at the back) the Poopó. 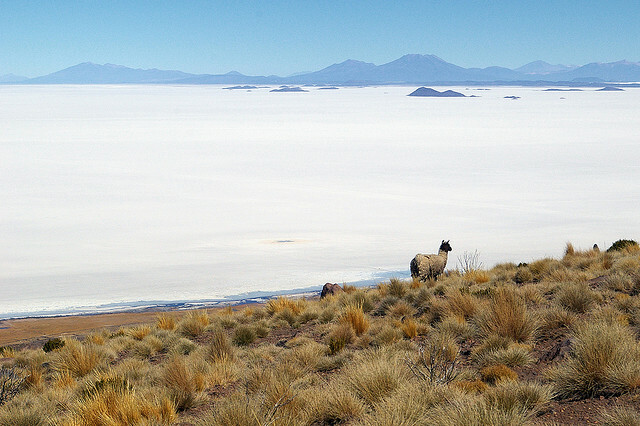 Two salt flats were left, the smaller Salar de Coipasa and the Uyuni. Twelve thousand square kilometers is pretty large by anyone’s standards. 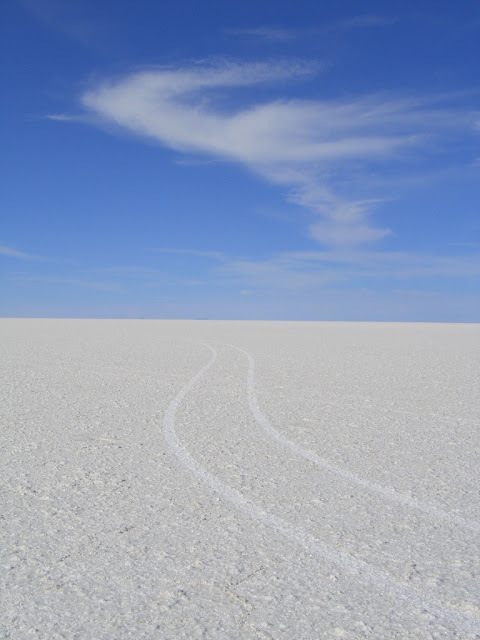 From a distance it appears like an enormous ocean, still and white. 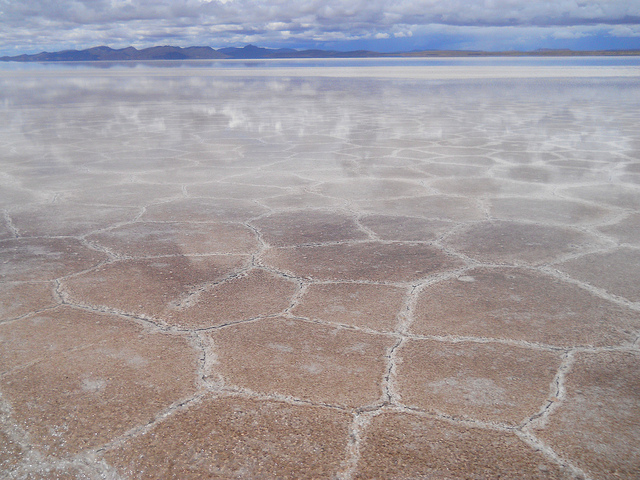 It is thought that the salt flats contains up to ten billion tons of salt. 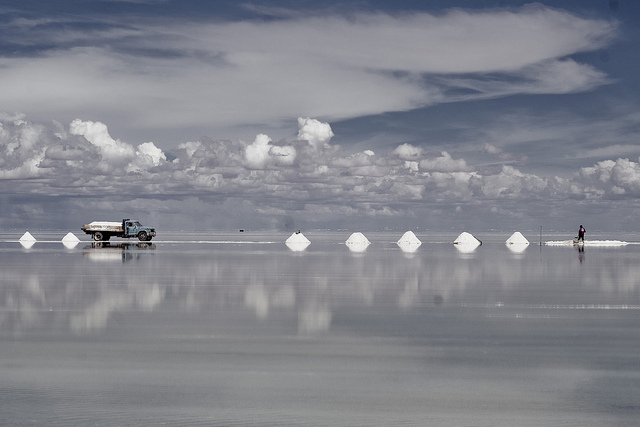 Each year around twenty five thousand tons is taken – all of the salt miners belong to a cooperative which shares the profits. 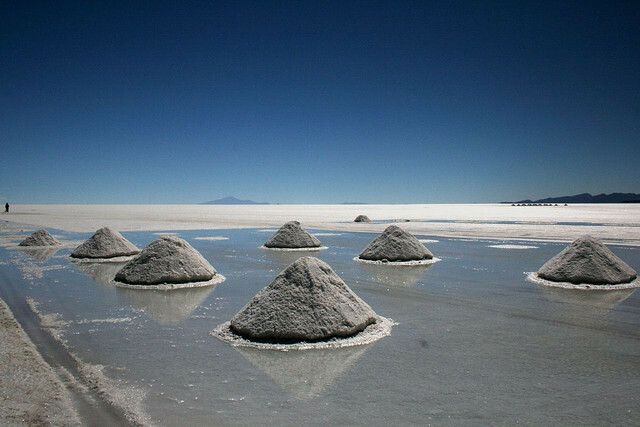 Although the mounds are created in a traditional way, when it comes to transporting it away from Uyuni, more modern technology is used. You didn’t expect llamas, did you? 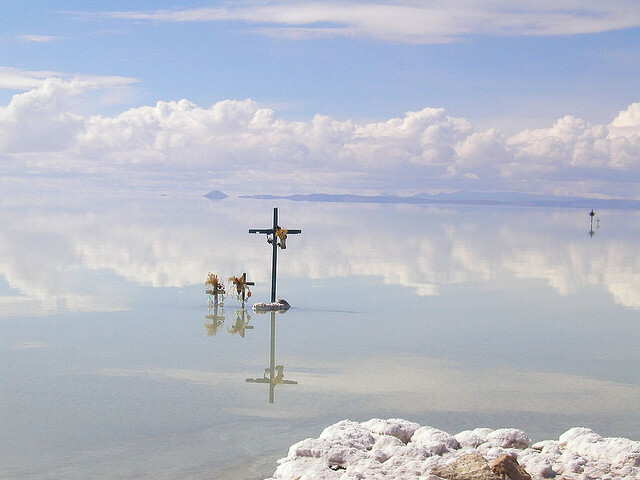 Certainly, the mounds of salt only add on to the unearthly appearance of Uyuni. 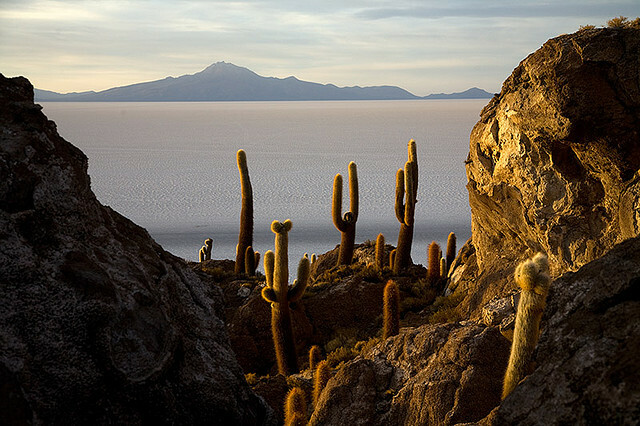 Even though it is extremely isolated it, located in the Oruro and Potosi departments in the Southwest of the country, the Bolivians encourage tourism to the area. 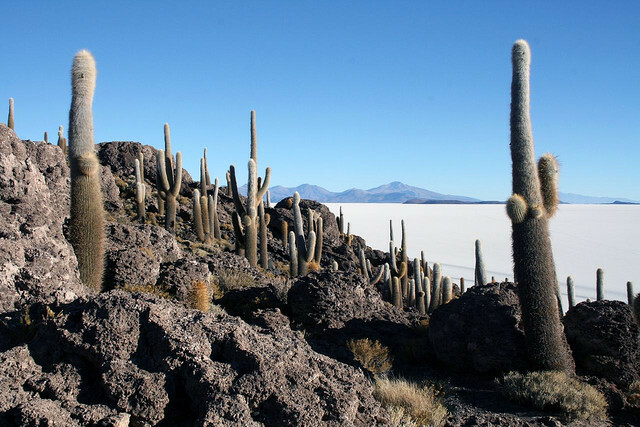 As it is near the crest of the Andes it is on the tourist trail and can be reached without too much difficulty for the more adventurous traveler. 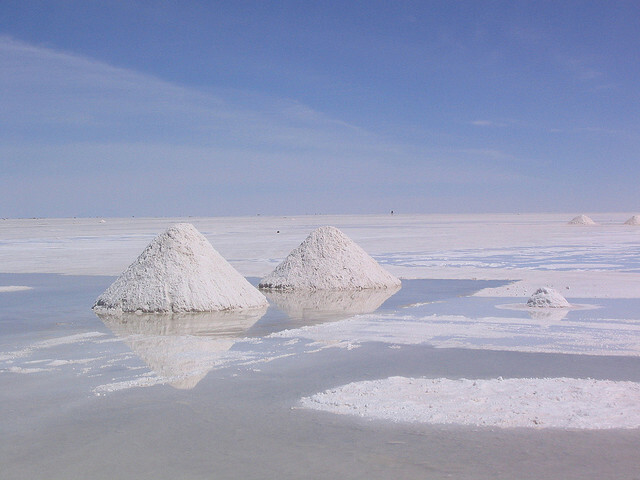 Coincidentally the major minerals to be found in salt are halite and gypsum. 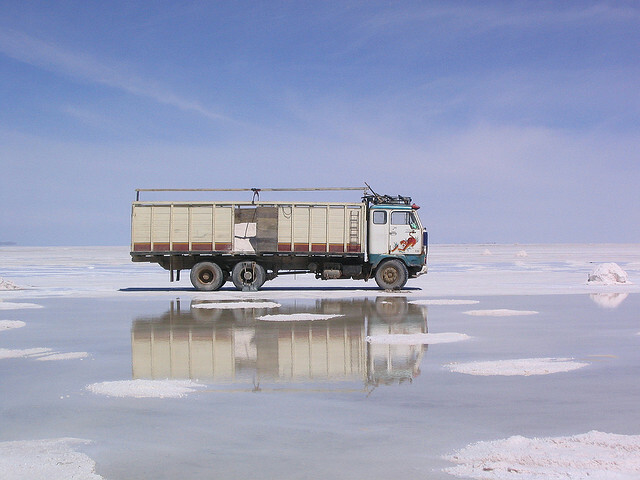 One use of halite is to keep ice off our pathways and roads while gypsum is used as a finish for walls and ceilings – you probably know it as drywall. 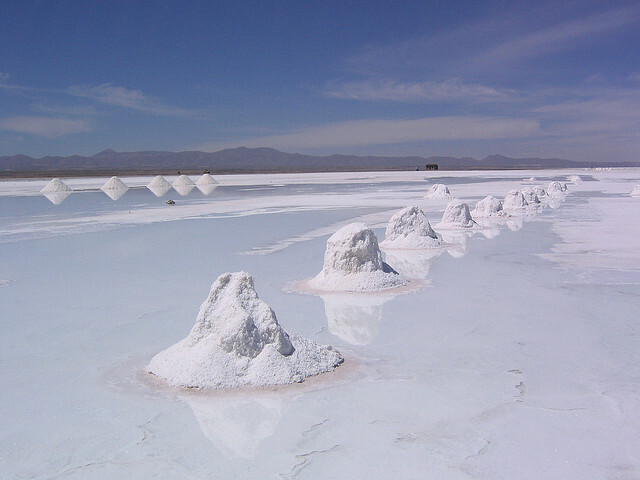 There are also considerable stocks of lithium in the salar, which are used in the production of batteries and certain pharmaceuticals. 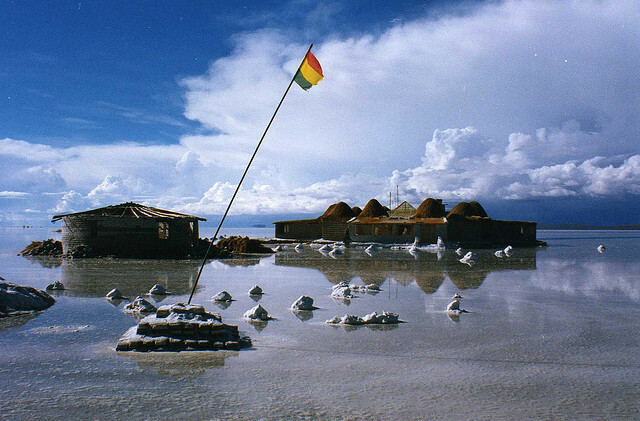 However, Bolivia as a nation exports none at the moment. 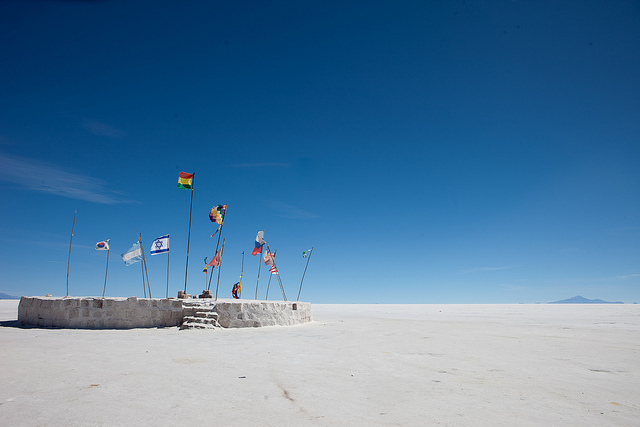 You may not have heard of Uyuni before today, but our astronauts have. It is used as a target for calibrating and testing remotes sensing systems on satellites in orbit. Why? It is big – very big – and has an incredibly smooth surface which is highly reflective when it is covered in water, making it perfect for that task. 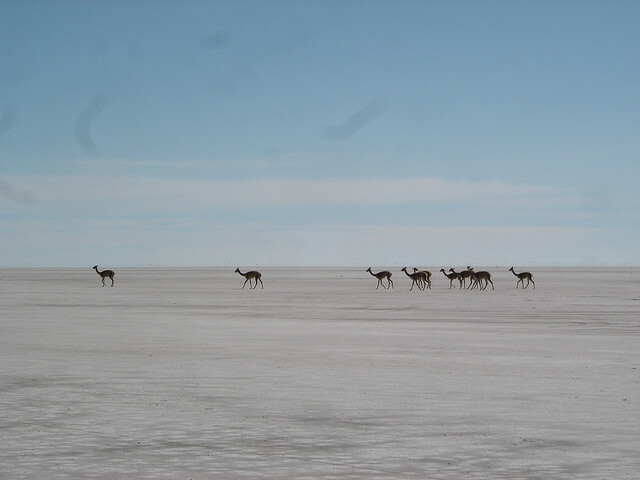 In terms of a wildlife vacation, it is probably not the best place to visit. 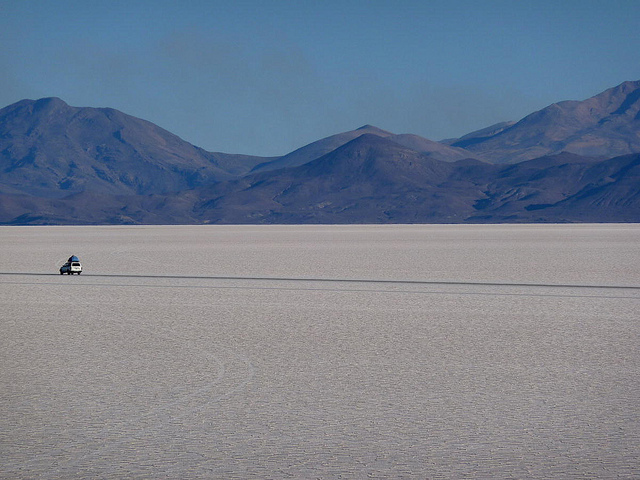 However, on the edges of the salt flats (and sometimes, even, upon it) you will find the ubiquitous lama. 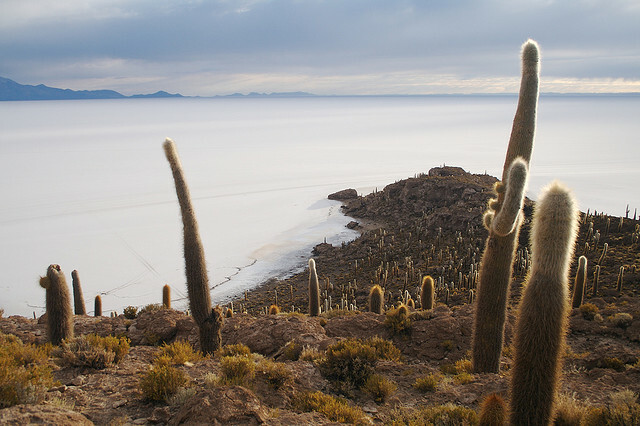 South of Uyuni the two other lakes and the mountains of the Andes dominate the view. 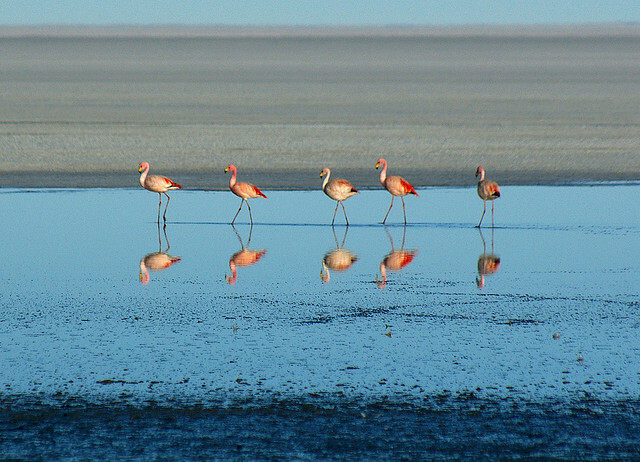 There are three different type of flamingo who visit these lakes and the sight of them flying in is breath-taking. 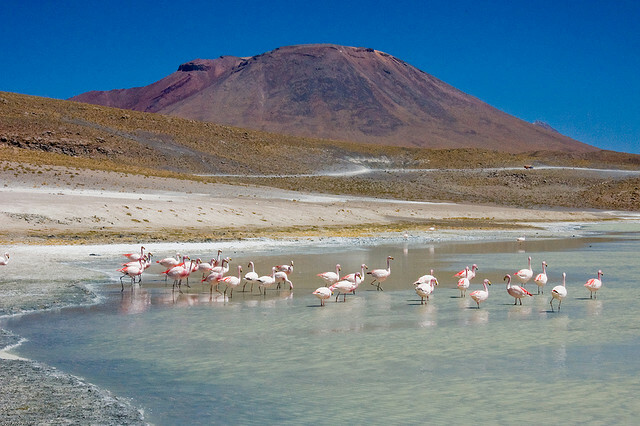 The flamingos are one of the few large animals that thrive in these areas – and you will see flocks of them on your visit. Where to stay though? 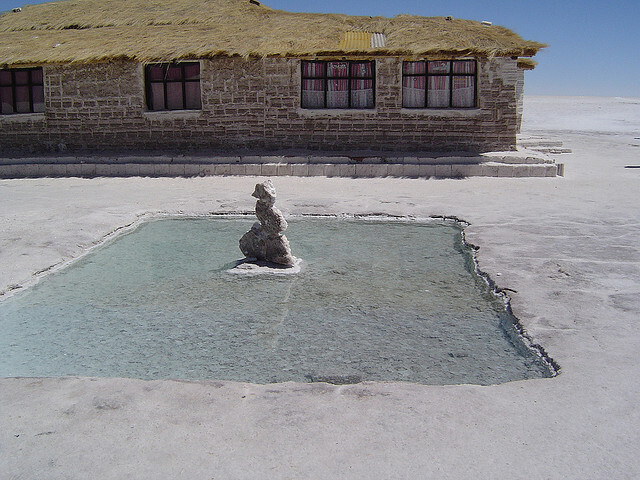 It would seem remiss not to take advantage of the hospitality of the local hotel, which is incidentally, completely made of salt. As for the furniture inside – likewise. You can even picnic if you want. 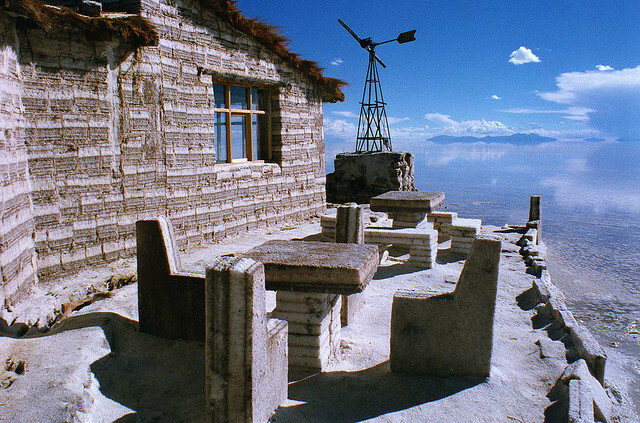 Of course, be prepared for your picnic table to be made of salt too. 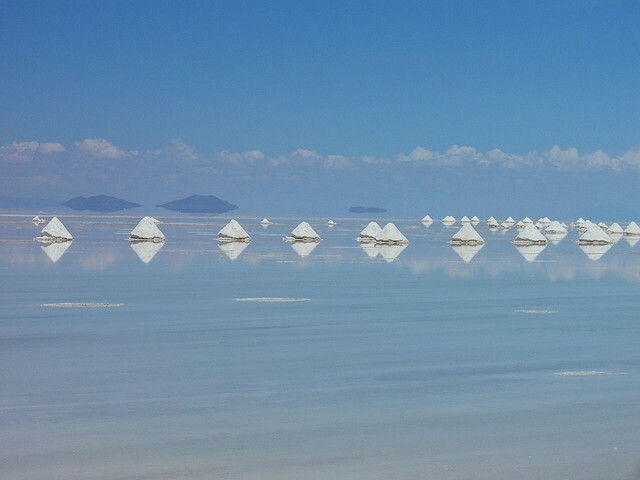 Of course the main reason people come here is to see the spectacular salt flats. 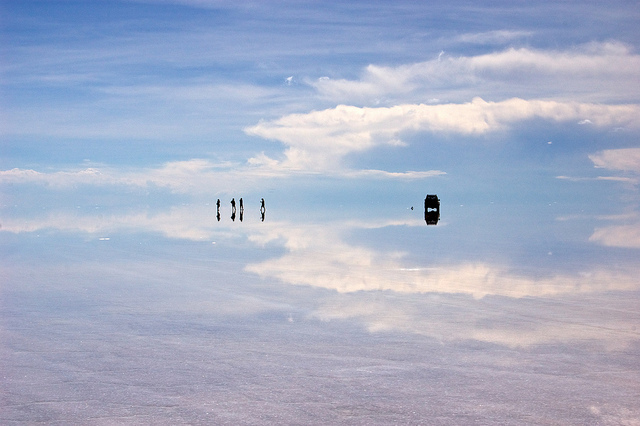 Although the pictures here are amazing, imagine how jaw dropping this place must be with your own eyes.